Mr. Griffith concentrates his practice Workers Compensation and Social Security Disability cases. The South Carolina Lawyers Weekly newspaper has featured Mr. Griffith for workers compensation and nursing home neglect cases. He was also featured in the South Carolina Lawyers Weekly newspaper for a successful negligence case against the South Carolina Department of Transportation for a low road shoulder with a seven inch edge drop which caused the death of the tractor trailer driver, extensive property damage, and environmental clean up. Additionally, Mr. Griffith benefits from his prior experience as an insurance claims adjuster for two major insurance companies in South Carolina. Mr. Griffith gives presentations and lectures for continuing legal education and other professionals regarding Workers Compensation and Insurance issues. Mr. Griffith is active in the community and has coached YMCA soccer as well as sponsored many different sports teams. 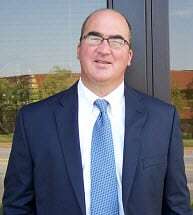 Mr. Griffith was previously a member of the Anderson County Big Brothers and Big Sisters Advisory Board and currently serves the community as a member of The Gideon’s International and as an elected member of the Anderson County School District Five Board of Trustees. He is married with three children.